Argentina’s wine regions attract wine lovers from the world over, who fall in love with the bountiful and unique wines produced here. One such man is Daniel Karlin, owner and operator of Anuva Wines, a wine club that offers wine tastings for visitors to Buenos Aires. 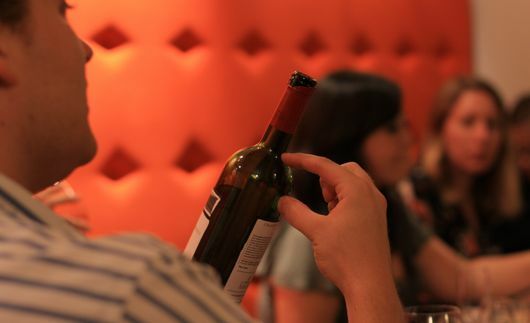 Anuva – a Spanglish wordplay on the word uva (grape), is also a name in India and Russia, translated as ‘knowledge’ and ‘new beginning’ – a perfectly fitting name and mantra for this new(ish) business which boasts extensive expertise of Argentine wines. Yes, Buenos Aires is a beautiful, cosmopolitan tourist destination, but it is still a large city, and large cities come with the typical risks. Violent crime is rare in Buenos Aires, but petty theft, pickpockets and scams are much more common. The best way to avoid them is to be alert and well prepared. Below you will find some important information and some simple suggestions that will help reduce any chance of trouble. Don’t go out with anything you don’t need. It is completely unnecessary to carry all of your cash and credit cards with you. If you have an ID card (a drivers license, for example) that is more easily replaceable than your passport, it will be enough for credit card transactions and the like. The only time a passport is necessary will be to exchange money – but if you are not changing currency, leave the passport at the hotel. If you must carry important documents like plane tickets, they would be safest in a money belt worn underneath your clothing. Be discreet. Don’t display large amounts of cash in public, and make sure to count bills while they are still in your wallet. It is also wise not to flash expensive technology that may be commonplace back home, so it’s best not to stand on a busy street corner near the curb to check your iPhone. Wearing expensive jewelry, clothing or accessories should be generally avoided, as should anything that could draw extra attention to you (which is a sensible rule to follow in any city in the world). Take care of your valuables. This mostly refers to women with handbags and purses. Be very careful about where you set things down, whether on a park bench or even inside a restaurant. If you are eating outside, keep your bag on your lap, or at the very least, on the floor with one leg through the strap. If your bag is on your chair (and this counts for inside too!) make sure it’s where you can see it. On the armrest is much better than on the back of the chair. And men are not immune – obviously this applies to camera and computer bags as well. In addition, sometimes it is easier to guard a bag than it is a wallet in a back pocket, so always be conscious of where you keep your valuables. General Distractions – Raise your safety alert level whenever someone is trying to get your attention. Thieves often work in groups and use ploys, such as, pretending to return money that you dropped, or dropping money themselves and then taking advantage of your awkward position as you stoop to help out. There is no harm in chatting with someone who talks to you, but keep your hand on your camera/bag/wallet as you do! ‘Accidental’ Spills – A common ploy used by thieves is to spill any sort of liquid on you, as a distraction. They will then grab your bag as you put it down to clean up, or even clean out your pockets as they “help” you out with a tissue or water. In some cases they may even try to get you to go around the corner to a supposed faucet. If you do have something spilled on you, LEAVE IT, and go inside somewhere safe to clean up. Refuse ALL help, no matter if its an elderly man or a woman in a business suit. A common variation on this is the “bird crap” approach – the thieves will somehow get a liquid on you that looks like bird’s mess (probably without you noticing), and then will come up to you to tell you and try to “help” clean it off. How kind of them! Radio Taxis – It is generally recommended that you take radio taxis, which can be most easily identified by having a sign on top of the cab. A radio taxi is one that works for a taxi company, rather than being an independent driver. Most of the taxis in BA are radio taxis and are a better option because they have set standards determined by their employer, and each individual driver can be traced back to their company in the event of any problems. Running up the meter – If you are not paying attention, a driver can easily take the “long way” to your destination to try to run up the fare (it can happen to unassuming locals too). The best way to avoid this is to have a general idea of where you are going and how long it will take you, and to state the address with confidence. If you feel you are being taken for a ride – politely ask the driver and you’ll find yourself back on track. Also, unless getting a taxi from the airport or cruise terminal (where taxi journeys are often a fixed price depending on your destination, and unfortunately more expensive), make sure that the taxi driver turns the meter (reloj, in Spanish – pronounced “REY-LOCK”) on as you start your journey – otherwise the driver could just make up and inflated price at the end of the trip. The meter is usually in the top right hand corner, above where the front passenger would sit. If not turned on, point at the meter and say “el reloj”, and the driver should switch it on. Bill swapping – a common scam in taxis is to switch out your good bill for a counterfeit bill. This usually happens when paying with a $100 peso bill, which is why you should try to only use smaller bills ($50 pesos or below) in taxi cabs. A taxi driver will take your bill, examine it, and then reject it and hand it back for whatever reason (it’s ripped, it’s fake, he has no change, etc). If a driver tries to return a bill to you, your alarm bells should go off… he has probably changed the bill for a fake – don’t take it! Of course, this can all be avoided by paying with smaller bills! Confusion from the airport – At the end of a long taxi journey from the international airport, it’s easy to get confused about the payment. This is especially true if the driver intentionally tries to confuse you! Some drivers will try to do this by changing the price, shuffling around bills, handing back strange combinations of change… basically anything that might get you to give more than you actually owe. 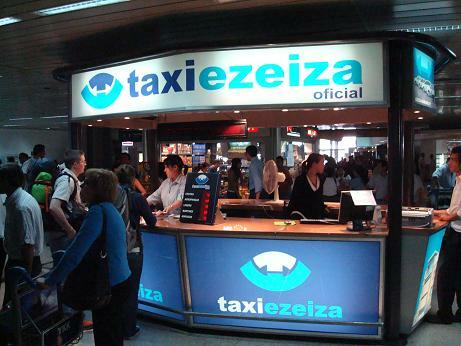 Problems can be avoided by taking an official taxi or remis, such as Taxi Ezeiza, where you pre-pay inside the airport at a taxi stand. The current cost with Taxi Ezeiza from EZE airport to the city center (as of February 2015) is 400 Argentine Pesos (between US$30 and US$48, depending on which exchange rate you use). There is no need to book with them in advance for the journey from the airport. But on the way back if you do then you can save 50 pesos! Yes, like in most places, counterfeit money circulates in Argentina, and it is often very hard to spot. The quickest and easiest way to check if a bill is real, is to hold it up to the light (fifties and hundreds have a metallic strip in them). At the time of last editing this addition (February 2015) it is still HIGHLY recommended that you bring US Dollars to Buenos Aires, for the majority of your travel funds, rather than changing money into Argentine pesos before you come here, or using ATMs in Argentina to withdraw pesos, funded from your account bank home. This is because, at present almost all places in Buenos Aires will accept US Dollars in payment in addition to Argentine Pesos, and in fact, often in preference to the local currency. And you will usually get a far better rate of exchange than any “official” exchange rate, plus incur no fees etc, so much more bang for your buck! Granted, it is good to also have some pesos with you too, just in case, as not everywhere is guaranteed to accept dollars, the most common place being taxis (due to their lack of change). This isn’t the place to go into why dollars are preferred in Argentina at the moment (this article is, a must-read and goes into other ways to get the best bang for your buck), and why you can get a better rate than the official exchange rates here, apart from to say that demand for dollars is high and supply is low here right now! If you have any other safety (& money) advice/tips for Buenos Aires that you would like to see added to this list, please add it in the comments below. Thanks!